Tunisia is in a state of political shambles. Egypt doesn't know if the army is siding with the protestors against the Cairo police or if it's staying loyal to President Mubarak. Thousands are protesting in Jordan. There's talk of riots to soon break out in Yemen. The common thread? Something that the average American is quickly becoming familiar with -- The Muslim Brotherhood. Seen left is a certain Mohammad Amin al-Husayni, Grand Mufti of Jerusalem and close personal friend to Adolf Hitler, inspecting the all-moslem Nazi Handzar SS Division, which he was instrumental in founding. In the 1920s, an Egyptian school teacher, Hassan al-Banna, gathered discontent Muslims to found the Muslim Brotherhood. According to John Loftus, a former prosecutor with the US Justice Department, "Al-Banna formed this nationalist group called the Muslim Brotherhood. Al-Banna was a devout admirer of Adolf Hitler and wrote to him frequently." Loftus adds that Al-Banna was so persistent in his "admiration of the new Nazi Party that in the 1930s Al-Banna and the Muslim Brotherhood became a secret arm of Nazi Intelligence. With the goal of the Third Reich to develop the Muslim Brotherhood as an army inside Egypt." While initial growth of the Muslim Brotherhood was moderate, the organization's membership rolls - coinciding with rising anti-Semitism in Europe -- by August 1938 had swelled to more than two hundred thousand members. By the end of World War II the Muslim Brotherhood had around half a million members. "To a nation that perfects the industry of death and which knows how to die nobly, God gives proud life in this world and eternal grace in the life to come" and "We are not afraid of death, we desire it... Let us die in redemption for Muslims," Al-Banna once wrote. Does any of that sound familiar present day? Does "We love death more than you love life" ring a bell? Another great admirer of Hitler was the Grand Mufti of Jerusalem, Mohammad Amin al-Husayni, "went to Germany during the war and helped recruit an international SS division of Arab Nazis. They based it in Croatia and called it the Handzar Muslim Division, but it was to become the core of Hitler's new army of Arab fascists that would conquer the Arabian Peninsula and, from there, on to Africa--grand dreams." War Crimes Investigator Says Al Qaida Spawned From the Nazi Third Reich. A former war crimes investigator explained how the terrorist network al Qaida spawned from Nazi and Islamic extremist movements following WWII. To his surprise, rather than travelling to Germany to investigate he was sent to the U.S. Government’s massive underground vaults protecting classified information. Loftus claims he was given complete access to the 20 acre-sized vaults, where he says he found some disturbing information. “I stumbled across some Nazi files I wasn’t supposed to see. No one was supposed to see them until the year 2015. The British Secret Service convinced American intelligence that the Nazis would be indispensable as “freedom fighters” in preparing for the next major war, which was anticipated against the Soviet Union. During his time in the government’s underground vaults, Loftus said he read a file on an organization known as the Muslim Brotherhood. In the file was information about a man named Hasam al-Banna who founded the organization in 1920. “Mr. al-Banna was a devout admirer of a young Austrian writer named Adolph Hitler. His letters to Hitler were so supportive that when Hitler came to power in the 1930s he had Nazi intelligence make contact with al-Banna to see if they could work together,” Loftus said. Hitler had al-Banna establish a spy network for Nazi Germany throughout Arabia. Al-Banna promised Hitler that when Gen. Rommel’s Nazi tank division arrived in Cairo and Alexandria, the Muslim Brotherhood would ensure all of the British troops would be killed. “These men were Nazi agents, they were spies, who adopted the Third Reich’s policy towards the Jews,” Loftus said. He spoke about another prominent member of the Muslim Brotherhood, a man known as the Grand Mufti of Jerusalem, who was the organization’s representative in Palestine. The Grand Mufti brought with him a hatred of the Jews. He was a principal organizer of the 1920 “Bloody Passover” massacre of Jews who were praying at Jerusalem’s Wailing Wall. 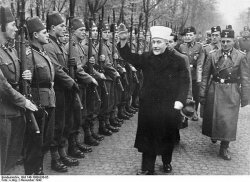 Following a failed attempt to create a Nazi uprising in Iraq, the Grand Mufti fled to Europe to organize international Arab forces for the Third Reich disguised as SS divisions. “In truth these forces were Arab fanatics, Arab Nazis from all across the Middle East,” Loftus said. Though a certain war criminal, the Grand Mufti and his troops were spirited away from prosecution to Egypt by the British Secret Service. According to Loftus, the Arab Nazis of the Muslim Brotherhood were sent to the kingdom of Saudi Arabia. “To keep them employed they were given jobs as religious education instructors,” Loftus said. While Islam is a very peaceful religion, Saudi Arabia practiced an extreme form of Islam called Wahhabi. “Here is this corrupt cult and all of a sudden the school teachers are Nazis. Here a fusion is born between the two. Schools of hatred were built all over Saudi Arabia,” Loftus said. A well known pupil of these schools is Osama bin Laden, Loftus said. Bin Laden and other graduates of the schools were inducted into an underground neo-Nazi Wahhabi army for Saudi Arabia. Just as Russia was using Communist Arabs during the cold war, we would use Arab Nazis as a counterweight to oppose them,” Loftus said. “When the Soviets invaded Afghanistan in 1979 the Arab (neo) Nazis were let out of the closet. “Because of the combination of Wahhabi fanaticism and Nazi ideology, waves of people came pouring into Afghanistan to kill the Communists,” Loftus said. The Soviets were defeated and the United States left. And, according to Loftus, Osama bin Laden took control and his entire army of neo-Nazi theological cultists were left there alive in the field. “Al Qaida is the direct lineal descendant of the Arab Nazis of the Muslim Brotherhood,” he said. “We let the Muslim Brotherhood, now known as Al Qaida, to roam free upon the world. Many,human beings have paid for that mistake. In the summer of 2002, Loftus said, the British intercepted a message which revealed a nuclear weapons plot between N. Korea, Libya and Iraq. Iraqi nuclear scientists were working in Libya using enriched uranium supplied by North Korea, according to Loftus. “Saddam new he couldn’t have a nuclear program in his country because U.N. inspectors were all over,” Loftus said. When the United States confronted Libya with the evidence, Mommar Khadafi agreed to cooperate. According to Loftus, Khadafi said there is a Chinese component as well. Not the official government of China, but the radical right wing People’s Liberation Army. This group supplied Libya with detailed instructions on how to build an atomic warhead. Loftus said had the plot not been discovered, the project would have produced an atomic warhead within 18 months. According to Loftus, Iran is the only country remaining that is attempting to develop nuclear weapons. When the International Association of Atomic Energy meets again, Loftus expects the member nations, including the European nations who opposed war in Iraq, to vote to impose sanctions against Iran. “We think the blockade will go into effect very quickly. Iran is the last country that is actively financing terrorist groups. It is one of the few places where sanctions will work because 90 percent of its economy comes from oil exports,” Loftus said. In the al Qaida plot to unleash a cloud of deadly chemicals in Amman, Jordan’s capital, that was foiled, Loftus said, the chemicals likely came from the hidden cache of WMDs created by Saddam. According to Loftus, evidence gathered by U.S. special forces, Israeli intelligence, statements by defectors, and satellite imagery point to three locations in Syria and one location in Lebanon where the WMDs are expected to be hidden. In an interview with The U.P. Catholic, Loftus said, “The evidence looks pretty strong. Is it a 100 percent sure? No. But there is a high degree of probability” that the weapons are there. He said this information has not been reported in the American media because the government will not confirm any of the information. However, he said, the story has been circulating through the European press. “We are at the tipping point in the scale. I think we are going to win. In the next 12 months we may see a number of other nations surrender without firing a shot. If half of what my intelligence sources tell me is accurate, we are in for a very good year,” he said. In summary, Loftus said he has spent his career trying to help make a difference. He says the United States is now paying the price for negligence of leaders who looked the other way for inexpensive Arab oil over the years. Loftus’ appearance at St. Peter Cathedral was sponsored by the Marquette County Interfaith Forum. Hassan al-Banna – Hassan al-Banna (Arabic: حسن البنا) was born October 14, 1906 and died February 12, 1949. 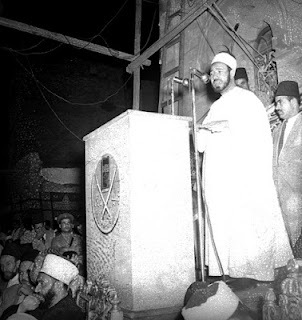 Al Banna was a radical Islamist and founder of the Egyptian Muslim Brotherhood (Jamaat al-Ikhwan al-Muslimun). Hassan al-Banna was born in Mahmudiyya, Egypt, north-west of Cairo. His father, Shaykh Ahmad al-Banna, was a well regarded and pious local Imam and mosque teacher of the Hanbali Madh’hab (school of Fiqh – jurisprudence). He was a scholar of Islam who wrote and collaborated on books on Muslim traditions, and he also had a shop where he repaired watches and sold record players. Shaykh Ahmad al Banna and his wife owned some property, but they were not wealthy. By age thirteen, al-Banna was already involved in politics, and participated in demonstrations during the revolution of 1919 against British rule. Hassan al-Banna joined the Hasafiya Sufi order when he was 15, having become interested at age 12. He entered the State Teacher’s Training Center and graduated first in his class in 1923 at the age of 16. Al-Banna moved to Cairo to enter the Dar al-Ulum college in 1923. Because of his father’s connections in the religious community, he met prominent Islamic scholars. He was also exposed to the breakdown of Islamic society in the city, and the trend to secularization, which shocked him. He was very concerned over the abandonment of Islam by younger people. He saw Islam as a religion besieged by the onslaught of Western culture, an onslaught that must be met by re-educating the young. Al-Banna became an eager student of Islamic reformists, especially the Egyptian Muhammad ‘Abduh, and ‘Abduh’s disciple, the Syrian Rashid Rida. Al-Banna was a dedicated follower of Rida and reader of Al-Manar, Rida’s magazine. Rida’s major concern, like that of Muhammad Abduh, was the decline of Islamic civilization relative to western countries. They both believed that this trend could be reversed only by returning to a “pure” form of Islam, free of all the exegesis and innovations that had diluted the strength of its original message. But while Abduh had wanted to use what he thought of as the original principles of Islam to forge reform and liberalism, Rida and especially Banna identified different original principles and had a different program entirely. Al-Banna believed that the main danger to Islam was not the conservatism of Al-Azhar and the Ulema. Though he criticized the conservatives, Al-Banna was more afraid of the ascendancy of the West and secularism. He wanted the conservatives to be more active in condemning atheism and Christian missionaries, and in combating colonialism. Al Banna decided to dedicate himself to becoming “a counselor and a teacher” of adults and children, to teach them “the objectives of religion and the sources of their well-being and happiness in life”. He graduated from Dar al Ulum in 1927 and took a position as an Arabic language teacher in a state primary school in Isma’iliya, near the Suez Canal Zone. In Isma’iliyya, in addition to his teaching duties, Al-Banna gave night classes to his pupils’ parents. He also preached in the mosque, and in coffee-houses. He placed himself at shrines where pious Muslims were likely to congregate, and put an eclectic face on his teachings, avoiding disagreement with traditions and local customs. For example, the worship of dead Muslim saints is considered shirk, that is polytheistic. Pious but ignorant people nonetheless made cults centers out of the grave sites of holy men, which in theory threatens tawhid – monotheism. Al-Banna appeared at these sites and did not criticize the practices. He used the gatherings to draw people into his movement and hold meetings explaining his views about Islam. He also downplayed his disagreements with the religious élite, who were not happy with his free introduction of Ijtihad – innovation in Islam. Al-Banna adopted semi-western dress rather than traditional robes, and a modest beard, to appeal to the widest Egyptian audience and look modern. Al Banna was repelled by the British and other colonial presence in Ismailiya, including the military camps, ownership of utilities by foreign concessions and the luxury hotels that contrasted with the slum housing of Egyptian workers. My brothers! The ummah that knows how to die a noble and honourable death is granted an exalted life in this world and eternal felicity in the next. Degradation and dishonour are the results of the love of this world and the fear of death. Therefore prepare for jihad and be the lovers of death. Life itself shall come searching after you. Restoration of the lost caliphate – i’adat al Khalifa al Mafqudah – is the chief immediate political goal of the Islamist movement. Anti-Semitism and anti-Zionism – The Jews are the agents of change and westernization, and responsible for the decline of the west as well as Islam. This was not a new theme in the Muslim and Arab world. Initially, the Muslim Brotherhood society seemed to be one among many small Islamic associations. These associations promoted personal piety and engaged in charitable activities. But the Muslim brotherhood was different. Al-Banna injected social content and economic messages into the Muslim brotherhood, making it into a channel for political discontent. Al-Banna’s big chance came during the Arab Revolt in Palestine, and the rise of the Axis powers. For Al-Banna and the Muslim Brotherhood, the Jewish presence in Palestine was another Westernizing colonialist influence that had to be stopped simply because it was Western. In 1936, the Muslim Brotherhood had about 800 members around Cairo. By 1938, it boasted nearly 200,000 members, with fifty branches in Egypt alone, as well as numerous branches in Jordan and Palestine. The organization established mosques, schools, sport clubs, factories and a welfare service network. On the eve of World War II there were more than a half million active members registered in more than two thousand branches across the Arab world. As noted, the purpose of the group was inherently subversive. Alongside the open layer of legitimate activities, the Brotherhood developed a network of underground cells (usar, singular usrah), They stole weapons, trained fighters, formed secret assassination squads, founded sleeper cells of supporters in the ranks of the army and police, and waited for the order to go public with terrorism, assassinations, and suicide missions. Al Banna claimed to be a Salafi, but a Salafi group has published a detailed critique of the Muslim Brotherhood and Al Banna: Historical Development of the Methodologies of the Ikhwan al Muslimeen and their effect on contemporary Salaafi Dawah. They maintain that Muhammad Abduh, Hassan al-Banna and Muhammad Rashid Rida created an activist movement that was falsely presented as Salafiyyah, but that al-Banna’s pretensions were purely a matter of political expediency. The growth of the Muslim Brotherhood was accompanied or caused in part by the fact that Al-Banna associated it with the German Nazi party and the Third Reich. From the ideological point of view, the Jew hatred, authoritarianism, addiction to violence and desire to defeat the British of both the Muslim Brothers and the Nazis were quite enough to make the two movements find common cause. The Brotherhood’s political and military alliance with Nazi Germany blossomed into formal state visits, de facto ambassadors, and overt and covert joint ventures. The Muslim Brotherhood transformed Nazi anti-Semitism into a Muslim version, providing Arab translations of Mein Kampf (translated into Arabic as “My Jihad”) and other Nazi anti-Semitic works, including Der Sturmer hate-cartoons, adapted to portray the Jew as the demonic enemy of Allah rather than the German Volk. When World War II broke out, al-Banna worked to firm up his alliances with Hitler and Mussolini. He sent them letters and emissaries, and urged them to assist him in his struggle against the British and the westernized regime of Egypt’s King Farouk. The Intelligence Service of the Muslim Brotherhood vigorously collected information on the heads of the regime in Cairo and on the movements of the British army, offering this and more to the Germans in return for closer relations. Hassan al-Banna attempted to run for parliament in 1942, but was dissuaded from doing so. Side by side with the clandestine network, al-Banna built a grass roots propaganda apparatus and a highly structured mass movement. Like the Soviet Communist Party, the Muslim Brothers targeted specific groups in society. They had separate sections in charge of furthering the society’s values among peasants, workers, and professionals. Similar to the Soviet Comintern and Agitprop and the Nazi Ministry of Propaganda, Al-Banna also created units entrusted with specified functions such as propaganda, liaison with the Islamic world, and press and translation. The Muslim Brotherhood organization became a model for later Islamist movements. In addition to Comintern style “sections,” Al-Banna relied heavily on pre-existing social networks, in particular those built around mosques, Islamic welfare associations, and neighborhood groups. Directly attached to the brotherhood, and feeding its expansion, were numerous businesses, clinics, and schools. This open layer of support was directly affiliated with the network of underground cells and helped to finance it. It formed both a recruiting ground and a mechanism for funneling money from charity into subversive activities. The underground cells of the Muslim Brotherhood began to carry out major acts of violence in the 1940s. The relaxation of military rule following the war made it easier to carry out these attacks. In a single week in 1946, four attacks, in which guns and explosives were used, were directed at British occupation forces, wounding 128 people. A group of Brotherhood figures were put on trial and found guilty by judge Ahmed El-Khazindar. Eight months later, the judge was assassinated by two Brotherhood members. In 1947 and 1948 several Jewish-owned businesses in Cairo were bombed by the Brotherhood, which also sent volunteers to fight in the first Arab-Israel war. The volunteers were incorporated in the Egyptian attack plans. However, the Egyptian government also announced that a large cache of weapons had been discovered at the home of a Brotherhood member in Ismailia. When it became evident that the war against Israel was an ignominious failure, agitation against the government and dissatisfaction increased, and the Muslim Brotherhood was prominent in leading it. On December 18, 1948, Prime Minister Mahmoud El-Noqrashi Pasha issued a military decree dissolving the group. Ostensibly, it had secretly plotted to overthrow the monarchy. Twenty days later, a young Brotherhood member assasinated Noqrashi Pasha inside the Interior Ministry building. Al-Banna was quick to try to dissociate himself from the assassination, which was in fact, in keeping with the teachings of the brotherhood and Al-Banna. He declared that those who had carried out the assassination were “neither brothers nor Muslims”. The government was not convinced. Al-Banna was killed at the age of 43, apparently by government agents on February 12, 1949.